Printed self-adhesive one-way vision window graphics, also referred to as a one way vision sticker, or Contra-Vision film or Contra-Vision sticker. Are the perfect solution for allowing your printed advertising graphic to be visible from the outside, but still allow you to see out from the inside. Most commonly Contra-Vision graphics would be applied on the windows of public transport, which use the window space for effective advertising, also commonly used by high-street retail stores for large window displays. What is Contra-vision and how does one way vision graphic work? 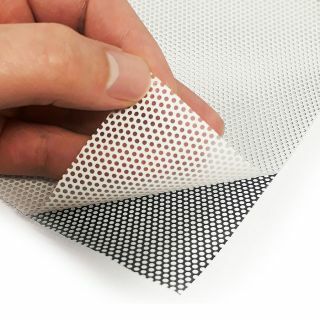 Contra-vision or One-way vision is a perforated vinyl film which has printed graphic areas and unprinted see-through areas covering up to half of the film. The see-through area created by perforation is sufficient for human eye to allow almost normal view. Combined with black colour backing, when looked at from the inside of the window, the film creates almost unobstructed, slightly tinted view effect. This effect allows for you to have a display that obscures the view from the outside, but will allow you to see outside through the graphic. Full colour digitally printed vinyl with lamination, perfect for large window or wall graphics, or for a superior finish, request your rigid board prints as vinyl applied and choose from a variety of finishes on lamination like Gloss, Matt, Satin, anti-graffiti or dry wipe.